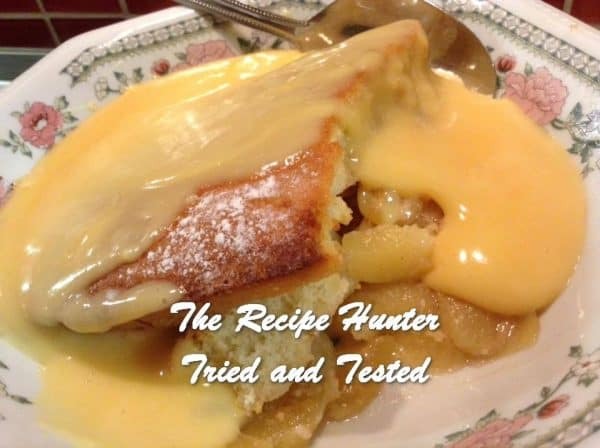 Apple Butterscotch Sponge pudding with custard to beat the winter blues 😘 💓 ❣Hope you enjoy! Preheat oven to 180 C/160 C fan forced. Grease an oven proof dish with cooking spray. Peel and core 5 apples, slice into wedges. Cook on stove for about 6 mins until slightly tender. Place apples in oven dish. In same saucepan heat together 1/4 cup brown sugar & 1/3 cup cream. Stir until it boils and thickens, pour over apples in oven dish. Beat on high-speed for 5 mins until pale and fluffy. Fold in dry ingredients with a metal spoon until combined. Add 2 tbsp melted butter and 2 tbsp hot boiling water & continue folding until well blended. Pour batter over apples and bake for 25 to 30 mins or until a skewer inserted comes away clean. Let cool slightly, dust with icing sugar and serve warm with vanilla custard.